I would like to give the readers the perspectives and feelings of my family and many of my friends who were born and raised here. My father Carlyle Cronig is 92. He was raised in Tisbury along with his brothers, David 94, Robert, 90, and sisters Ruth 86 and Ann. Giving back to the community was part of their lives. I still hear stories about my grandfather’s generosity in the market. I grew up listening to the pros and cons about change. My family taught me that change can be good even if it may be new and unsettling at first. There’s always a chance you will offend someone when you take a position on an issue. That is the challenge of public service. When I was on the planning board for 11 years and the wastewater committee for 10 years we tackled some divisive issues. Remember the scare tactics? If sewering were to pass, the sky was going to fall, the high rises were to be built, and the line used ad nauseam was: “The character of the town will change.” The list of doomsday prophecies that were going to destroy Tisbury never materialized as the town changed to accept sewering. • There will be no bars, no taverns, no package stores and no hard liquors served. • The selectmen will check that a restaurant sells at least 65 per cent food to 35 per cent beer and wine. Restaurants have to submit their sales figures. Only restaurants with more than 30 seats and wait staff may apply for a license. • All of the board of health rules, all the zoning rules, etc., will continue to regulate growth in Tisbury. The selectmen will be the regulatory authority, approving licensing fees, hours of operation, physical layouts etc. The selectmen have published a 15-plus page booklet with additional rules and regulations after months of discussion. • It will be up to the restaurant to decide if they want to apply for a license. In Rockport, which recently went wet, a few establishments elected to remain BYOB. • A yearlong committee established by Tisbury selectmen concluded that public safety would not be jeopardized. They interviewed the police and fire chiefs. Statistics indicate that charges of driving under the influence have not changed in towns that went from dry to wet, nor police calls. Tisbury’s police department is the same size as Oak Bluffs. • Any changes at all would require this entire process again of submitting a warrant article, town meeting vote, state approval and ballot box vote. Our children will not be corrupted and follow the path of evil and sin because their parents can now buy a glass of beer or wine with their meal in a Tisbury restaurant. The nice family in the restaurant will not suddenly be transformed and get drunk because they paid for a glass of beer or wine with their meal in the town of Tisbury, rather than driving first to Oak Bluffs or Edgartown, and bringing it back to the same restaurant in Tisbury. The majority of Tisbury voters are not going to fall for the fear factor. Customers may find that they may drink a little less because they are paying for it in the establishment. They can have beer or a glass of wine with a meal, served in the exact same place where they had recently lugged in their gin and tonics and coolers of beer. Hard alcohol may not be consumed in an establishment that sells beer and wine with a meal. The town of Tisbury will now make some additional revenue. Now customers will leave the restaurants knowing that while they had a great meal, they have not only helped the restaurants and their employees, but all the other local people that provide services to the restaurants each day, along with the local food economy and their families. Our town will benefit from the taxes and fees charged. This money will go back to the town of Tisbury and not into the coffers of Oak Bluffs and Edgartown package stores. Prohibition in this country ended 75 years ago this month. It’s now time for the Tisbury voters to ratify the Twenty-first Amendment to the United States Constitution, which was the repeal of prohibition. 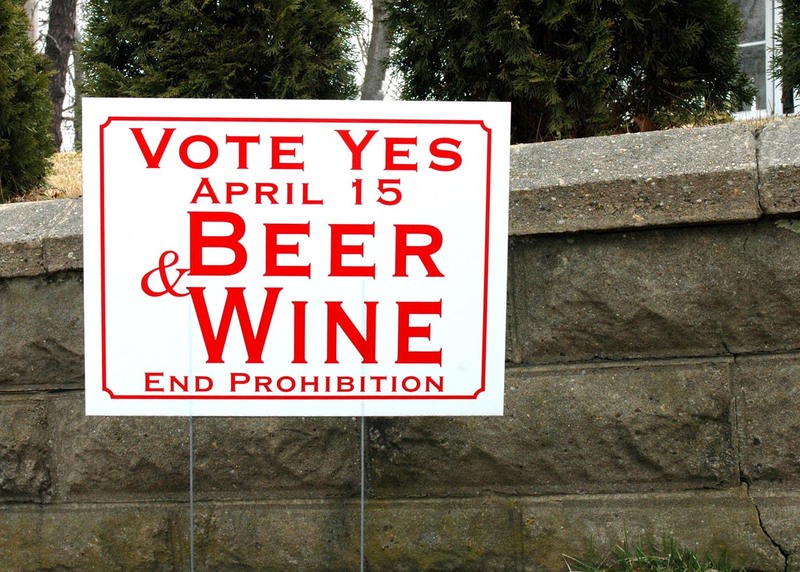 If you are 18 years of age or older, and hopefully registered to vote in Tisbury, tell all of your friends that can vote, to please learn the facts and go to the polls at the American Legion Hall on West William street in Tisbury on Tuesday, April 15 between noon and 8 p.m., and vote yes for beer and wine. As a resident of Vineyard Haven, I often walk into town or walk home from the ferry. Sometimes I will run into a friend and stay and talk for a while. Being able to sit down for a beer and a hamburger, or stay in town for dinner and a glass of wine (and do this without a lot of planning and scheduling) should be a normal and pleasant part of that experience — certainly not out of character with the routines of our daily life. More broadly, Vineyard Haven is the Island’s year-round town and its main gateway. As such, we need to make an extra effort to welcome visitors and make them feel at home instead of sending people away just when they need to sit down, relax and have a nice meal. Our existing regulations are not helpful in this regard. While stating that this is a dry town‚ we are simultaneously encouraged to circumvent this rule by bringing our own bottles with us when we eat out. For visitors, there is no option but to move on down the road. The new regulations take a more balanced approach, excluding the extremes and allowing us to pick something that goes with what’s on the menu that night. Finally, the new regulations return control over these issues to us, the residents of this town. As time goes by we will likely need to make adjustments — the number of licenses, fees, enforcement and the like. These are questions best handled by the community itself, among friends and neighbors who have the town’s best interest at heart and who, through town meeting, will have the last word in how they are applied.